Your tablet is probably your go-to device for everything from reading books to watching TV, but we think you can push it even further. The right accessories can make it work harder than before, whether you need to turn it into an impromptu boombox with a portable speaker or want it to help you boil water on your next glamping getaway (yes, really). Here are some of the essential tablet accessories you need to know about. From the iPad to the Samsung Tab and even the Amazon Fire, tablets have quickly become part and parcel of our lives and tablet accessories are becoming as integral as the smartphone’s bigger cousin. For the iPad Air owners amongst you, the Rugged Book is the “toughest, most versatile, wireless Bluetooth tablet keyboard” available on the market. Are you ready to be the Bear Grylls of the tablet world? Is that even a thing? 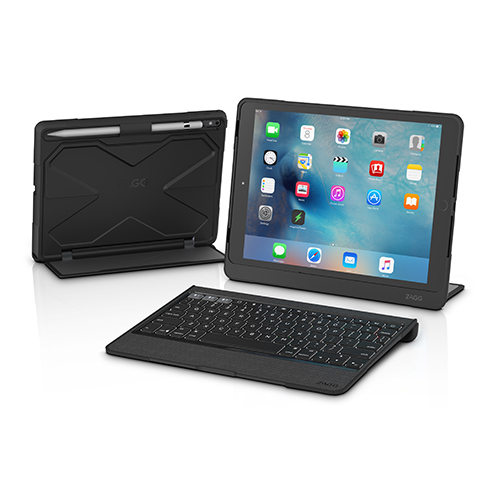 Just don’t despair if you own a different type of iPad – Zagg sell rugged cases for most. The fantastic magnetic hinge makes this tablet accessory able to act as a case, keyboard, cinema and book. 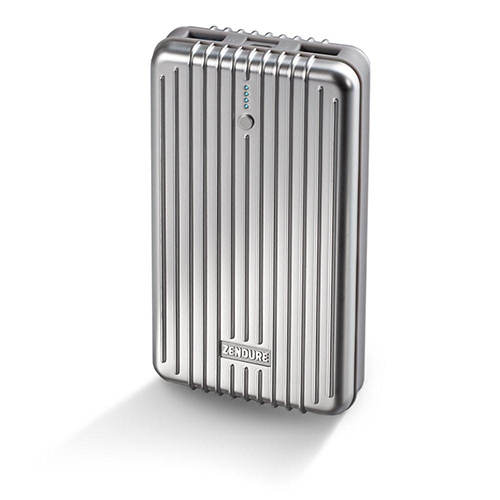 It can last for up to two years on one charge (assuming an hour-a-day’s use). With a backlight keyboard function, you probably won’t need another case as long as your tablet lives. Given the battery life of the Rugged Book… well, it might end up outliving you. Having to hold your tablet everywhere can get tiresome for your poor little arms, and leaning it against various household items while trying to binge-watch House of Cards is impractical. The Plinth tablet stand solves these pesky problems and also fits into your back pocket, keeping your tablet truly mobile. Designed and made in the UK, it’s ready at the touch of a button and even featured (quite impressively) on Dragon’s Den last year. 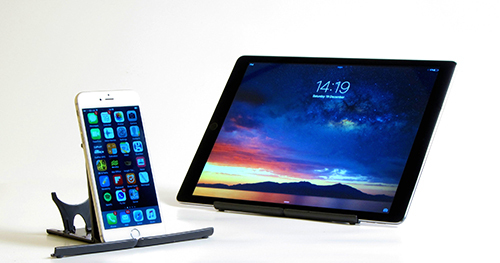 It’s versatile, adjustable and acts as a stand for your iPhone 7, Samsung S8, tablet (it’s holding an iPhone 6+ and an iPad Pro above) or even your Nintendo Switch, any phone or tablet (with or without a case). Did we mention it also comes with a lifetime guarantee? 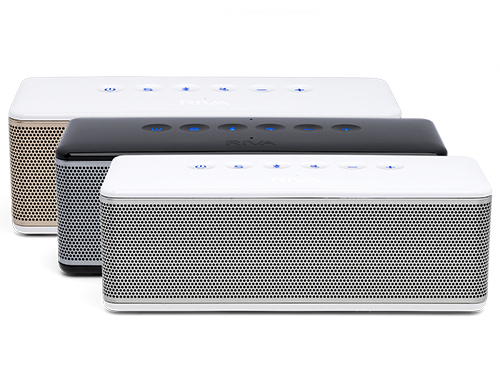 The Riva S is a top-quality Bluetooth speaker, designed for music, movies and watching copious amounts of Netflix (now that Go Binge is letting you watch as much as you want) via your tablet. With 13 hours’ battery time, perfect sound and a multi-user party mode, the days of having a tinny, small speaker while you and a huddle of friends listen to poor audio (making for a frankly awful party) are long behind you. With water resistance and the ability to sync two speakers for left and right channel audio, you’ll be truly immersed. You might even start believing you’re on the set of Stranger Things. Running out of battery is the bane of our lives. And definitely one of the top five biggest causes of stress facing millennials in 2017 (kidding. Sort-of). Whether you’re out and about and just need to make a call to get home, or you’re a stickler for being prepared, you want your tablet running on ample juice. The Zendure A5 can charge your device four or five times before running out of power (we’ve actually found it does it even more) and works with a variety of USB-charged devices. Unlike a majority of portable chargers, it can charge through – one of the most useful features we’ve seen – allowing you to charge your phone and the A5 at the same time. This smart charger even knows how to turn itself onto standby when not in use. It’s small, powerful and we wouldn’t go anywhere without one. A great pair of noise-isolating earphones that won’t break the bank, for all those times you want to watch shows and listen to tunes, without disturbing or being disturbed by the outside world. It’s particularly strong on high-fidelity vocals and comes with all of the bells and whistles you’d expect from a brand like Brainwavz. 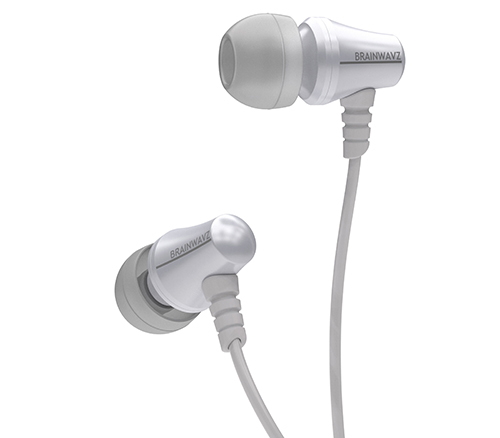 Stylish, with trademarked foam tips, these are also possibly the comfiest earphones we’ve ever tried. The three-button remote is as easy to operate as any other and the microphone means you’ll never have to take them out. For the environmentally conscious and any avid campers among you, this is one of the most innovative (seriously, who came up with this, it’s brilliant?!) tablet accessories we’ve seen to date. 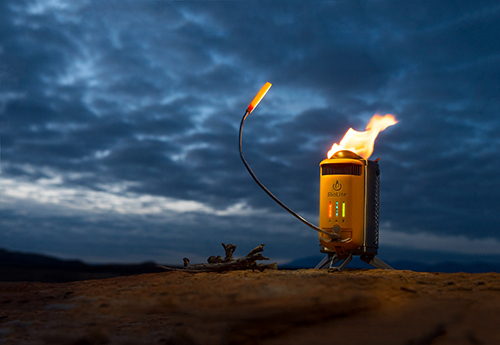 This campstove not only burns a smokeless fire from normal biofuel (think sticks, wood, embarrassing photos, cards/presents from your ex), to cook and boil water, it’ll also use that excess energy to generate electricity to charge your tablet. This is one of those futuristic accessories that can revolutionise the most traditional of activities: outdoor camping. Now who’s got the marshmallows? We’ve a confession to make. Most of us here have really fat fingers. Like sausages. Fine for everyday tasks like wiping away our tears and using our hands as eating utensils, but for the more intricate things, i.e. tablet use, we prefer the Sensu Brush and Stylus. Your tablet is a lot more than a big phone or an undersized laptop – it’s the canvas you’ve always dreamed of having. But what is a canvas without a brush? (Hint: it’s an empty canvas). 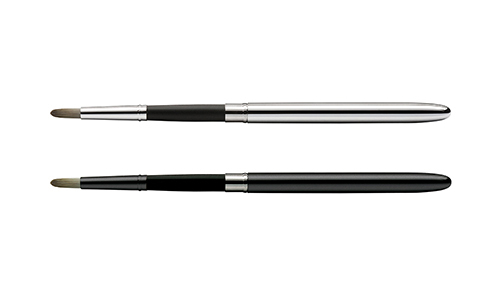 The Sensu can be a useful writing and sketching tool or can be used as a general stylus. It doesn’t hurt that it’s as gorgeous to look at as a calligraphy brush. 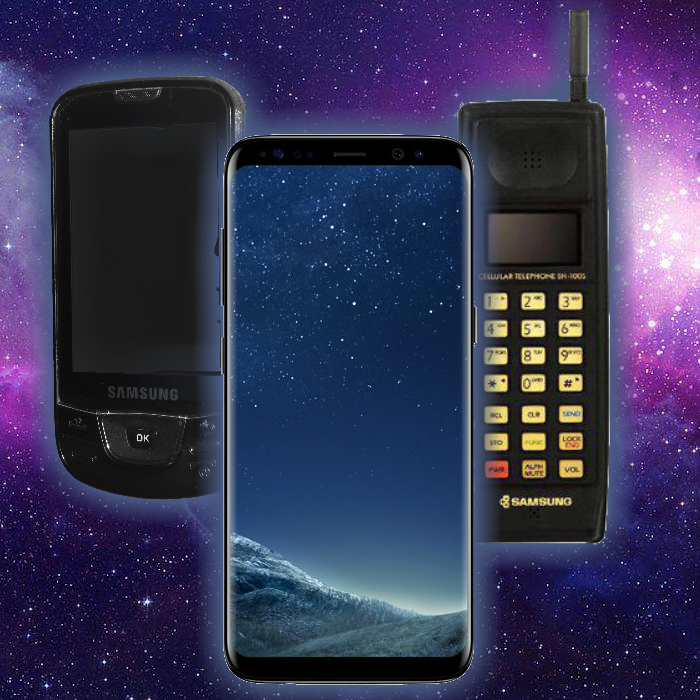 A brief history of Samsung phones.